Giving a patient a statin means implictly making a trade off beteen cardiovascular benefits and metabolic risk. While regulatory agencies have deemed statins to be safe to use for their intended purpose, no drug is without side effects in susceptible individuals. As the use of statin drugs continues to increase and people have been taking statins for over a decade - a significantly longer than the time period required for testing drugs - we are learning more about the side effects in large populations. The drug companies that manufacture statins have added a warning to the medicines' advertising and labels that was not present when statins first hit the market. The warning tells patients about the possibility of muscle pain and weakness as a rare but serious side effect. Muscle pain and muscle weakness are two of the main side effects of statin drugs. The scientists who study this put them in a category called muscle-related adverse effects (MAEs) Another common side effect is memory loss. Anyone who is taking statin drugs for any reason should be aware of these side effects and their symptoms. The medical establishment recommends that anyone who suspects they are experiencing any of the possible statin side effects consult with their caregiver. Muscle symptoms are a common side effect of statins; many people experience aches in the shoulders, pain in the jaw, or muscle pain in the legs. The pain indicates muscle breakdown. When tissues break down, the body must eliminate waste products. The waste products - among them creatine kinase - can overload the kidneys, causing more serious problems. When a patient approaches a doctor about muscle pain after beginning a statin regimen, other factors about the patient must be considered. If the patient is a vegetarian, he or she may have muscle pain due to carnitine or vitamin B12 deficiencies. The statin may be the "straw that breaks the camel's back" and raises the pain to a noticeable level. In this case the patient doesn't necessarily have to quit the statins, just to take other measures to correct deficiencies. Dietary supplements of vitamins as well as alcohol can cause muscle pain which might be confused for statin-induced pain. And patients who eat red yeast might inadvertently end up taking a higher dose of statin than planned. Patients complaining of muscle weakness or soreness are often evaluated with ankle-brachial index devices to measure differences in blood pressure through the body, which can be a sign of vascular disease. Creatine kinase levels in the blood can be measured to look for clinical myopathy or rhabdomyolysis. Because these levels naturally rise after strenuous exertion, they are not measured within 72 hours of exercise. It is estimated that myopathy strikes 2 to 5% of statin patients, but that estimate could be low (1) because it is hard to break out the side effects of statins from other bodily conditions, (2) because pain levels may be so low that patient doesn't report them, and (3) because in general the causes of muscle pain (and this includes the etiology of statin-induced myopathy) are not well understood at a biochemical level. Much of the data for the effects of statins on myopathy comes from the Prediction of Muscular Risk in Observational conditions, (PRIMO) survey from 10 years ago. It found the elevation of creatine kinase levels was related to the dosage of statins given the patient. The frequency of rhabdomyolysis, although always rare, increases with dosage, too. Note that the dosages given patients in actual practice are often lower. These numbers are shown only for comparison and to indicate that muscle pain of some sort can be common. Rhabdomyolysis (often called rhabdo for short) is the medical term for the breakdown of muscle fibers that results in the release of muscle fiber contents into the bloodstream. Besides muscle pain, the other major symptom of rhabdomyolysis is dark, red, or cola colored urine. Severe rhabdomyolysis can result in death from acute kidney failure due to overload of the kidneys with deteriorated muscle tissue. While most people who experience muscle pain will return to normal after discontinuing statin use, some susceptible individuals suffer permanent muscle damage from statin use. The human nervous system consists of the central nervous system, which is the brain and the spinal cord, and the peripheral nervous system, which contains all the other nerves. The peripheral nervous system controls autonomic (that is, automatic) functions of the body like breathing and heartbeat. Neuropathy, short for peripheral neuropathy, simply means a malfunction of the peripheral nervous system that occurs without any inflammation of the nerves. There are many causes of neuropathy, including injury to the nerves caused for example by an accident or various diseases like diabetes and kidney problems. The occurrence of toxic or poisonous substances in the body is another one of the ways neuropathy occurs. There are over 100 types of neuropathy, each with its own cluster of symptoms that can be diagnosed by a neurologist. For susceptible individuals, the use of a statin drug can interfere with proper functioning of the peripheral nerves. Scientists think that the build-up of statins in the body causes neuropathy in some individuals. Muscle weakness is frequently a symptom of neuropathy and the muscle weakness may develop in a matter of days or may slowly progress over weeks or months. Individuals may simply not recognize the progressive muscle weakness and excuse the symptoms away as the result of being tired, overexertion, or just getting older. For those who take statins, keep muscle weakness in mind as it could be a sign of a side effect that requires medical attention. Other symptoms of neuropathy include: numbness, tingling, and pricking sensations; burning pain (especially at night); and/or sensitivity to touch. If left undiagnosed, neuropathy can lead to deterioration of the muscles and paralysis. Remember that we all need throat muscles to swallow, chest muscles to breathe, and that the heart is a muscle. In the extreme, severe neuropathy as a side effect to statin use can lead to death. Some researchers estimate the 1 in 10 people who take statin drugs will experience a mild form of neuropathy where the symptoms may be a feeling of tiredness, difficulty in arising from a low chair or getting out of bed, shortness of breath or difficulty walking. Small countries like Denmark or Iceland are great for studying medical conditions. Because the population is genetically similar as opposed to the vast melting pot of the United States, it is easier to conduct a controlled study. A famous Danish study of neuropathy as a side effect to statin use concluded that an individual who is a long-term user of statin drugs has anywhere from 4 to 14 times greater risk of developing peripheral neuropathy than a person who does not take statin drugs. Typically, long-term use of statins is defined as 2 years or more but neuropathy can occur even after just a few days of use in a susceptible individual. Some people experience memory loss, report an inability to concentrate, or feel that they are developing Alzheimer’s disease when taking statin drugs. (Coincidentally, a new study suggests that Simvastatin actually lowers the risk of Parkinson's and Alzheimer’s diseases.) This memory loss may be so extreme as to be amnesia that lasts for 6 to 12 hours. These types of problems are known as cognitive defects. Other people experience mood swings and other behavioral changes when taking statins. These differences in behavior are not just subjective feelings on the part of the individual but tend to be corroborated by family members. A systematic review of the cases reported to the FDA determined that approximately half of the memory loss problems occurred within 60 days of starting on statin therapy, although memory problems were reported after taking a statin drug for just 5 days. Fortunately most people return to normal after discontinuing the statin drug. The time until recovery appears to be related to the amount of time before the cognitive symptoms appeared; that is, the longer it took for the symptoms to appear, the longer it took for the person to recover. However, a small group may continue to suffer with cognitive problems longer, perhaps indefinitely. The risk of experiencing memory problems while taking statins did show up in the first clinical trials of statins but memory loss occurred in less than half of one percent of the people in the clinical trials. Meanwhile, about 2 percent of the cases of side effects of statins reported to the FDA at the time these cases were studied concerned cognitive problems including memory loss. There are two other points to consider. One is that amnesia used to be a rare phenomenon, especially transient global amnesia (TGA) where individuals can forget major details of their lives for hours only to return to normal until the next episode. Now TGA is occurring with increased frequency. At the other end of the spectrum, it is impossible to know how many people who are taking statins simply ignore small lapses of memory or lack of attention. At this point in time, public health officials do not have an estimate of the incidence of memory loss associated with statin use in the general population. A recent study raises the possibility that statins increase the risk of delirium in patients after surgery. Researchers at the University of Toronto looked at data from 284,000 people after surgery. Delirium is known to be underdiagnosed in these cases, but the researchers estimated that it occurs after 10% of all surgical procedures, and after 13% of procedures in people taking statins. Because delirium can increase recovery time, this is an area of concern. 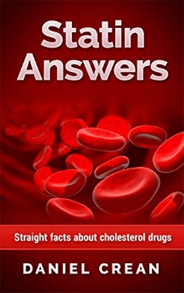 The hypothesis is that the statins cause blood flow to the brain to reduce in favor of flow to the heart, although there is no firm evidence that this is happening. The researchers admitted that more work is needed to answer questions regarding surgery and statins, and they did not recommend stopping statins before surgery until more is known. The FDA amended its requirements in 2012 so that the warning labels on statins must mention the risk of cognitive effects. Doctors have long reported patients feeling tired after starting a statin regimen. Now a study has established a link between statin use and fatigue. Researchers at the University of California, San Diego studied people who took pravastatin and simvastatin, but their results can be generalized to other types of statins. Patients feel decreased energy or get tired more easily when exercising. Women have this problem worse than men. Even modest doses (20 mg/day of simvastatin) produced a statistically significant effect on subjective measures of energy. Reports of fatigue were long thought to be subjective reports of myopathy or muscle weakness. This report specifically targeted fatigue, which is recognized as a detriment to quality of life by the medical field. Their effect on muscle fibers and the tendency to cause fatigue brings up the topic of exercise and whether statins make it more difficult to execute a work-out routine. There are anecdotes about patients who think statins harm their athletic performance, but formal establishment of an effect is not so clear. A recently published study showed that rats given statins were not able to run as far as rats without the drug. Analysis of the muscle showed animals on the medicine had less glycogen and there was evidence of mitochondrial damage. Mitochondria are the parts of the cells that burn fuel for energy. If statin use makes exercise more difficult and less fun, it could inadvertently lead patients to become more sedentary, which is the opposite of what is desired. Increasing concerns about muscle-related adverse events are leading to the idea that lower doses of statins should be prescribed than current practice. Recent research has found a mild increase in diabetes risk associated with statin usage. The study, which focused on older women, was an observational study (as opposed to a blind study comparing two regimens). It followed women who took different types of statins, so it did not find that one particular medication was worse than the rest. More work is needed to establish a connection between statins and diabetes, but if there is one, it could alter the calculation on whether to administer statins as a preventative measure. However, the FDA started requiring warnings about diabetes on all statin medications in 2012. Researchers have looked for a connection between arthritis pain and statin use, but not been able to find one. Some have even suggested use of statins may ease arthritis symptoms.